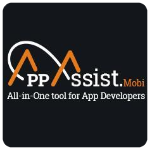 AppAssist.mobi is the useful tool for App distribution, Visual feedback, Crash reporting and Analytics for mobile developers that help them communicate with their users, collaborate with their teams and build better apps. We allow regular mobile users or beta testers to submit their feedback or report bugs about any mobile app in the most intuitive way; by just SHAKING their device! We also enable teams working on mobile apps to collaborate with each other more efficiently using our dashboard, where they can assign bugs, comment on them and add tags.